While in Syria, Hadrat Bilaal Radi Allahu Ta'ala Anhu got married but it is not known whether he had any children or not. The author of Asad al-Ghabbah states that at the time of death, Bilaal Radi Allahu Ta'ala Anhu had no children. The great devotee and Muazzin of Rasulallah SallAllaho Alaihi wa Sallam, the courageous and beloved Abyssinian by the name of Hadrat Bilal Radi Allahu Ta'ala Anhu passed away in the 20th year after Hijrah in the middle of reading Adhan in Damascus, Syria between the years 638 and 642 (AD) at the age of 60 or 63 and there he is buried near 'Bab as-Sagheer'. When beloved Prophet SallAllaho Alaihi wa Sallam proclaimed Prophethood, he was 30 years old. He spent the remaining 33 years of his life in the assistance of this Deen, persecuted severely for admitting his Islam and despite this, he continued to announce boldly, 'Ahad, the One Allah!'. He participated in the battles and endured both hunger and pain. He was not only a Mu’azzin, but was granted the status of being the leader of the Mu’azzins. Even though the the message of Islam attracted many converts from different parts of the world during the lifetime of the Prophet, due to the socio-geographical starting point of this call, the responsibility to carry this message to the rest of the world mainly fell upon the Arab companions of the Prophet after his death. From Arabia, his companions spread across the world, covering a region from Portugal to Indonesia and from the northern Caucasus to the southern Sahara. Some of them arrived as conquerers whereas others arrived as merchants, migrants and governors, while some arrived simply to call people to faith in the one true diety. In doing so, some never returned home, and instead chose to be buried in foreign soil, serving as a reminder of their great sacrifice for generations afterwards. One such companion is Umm Haram bint Milhan, who unlike what one would typically imagine these fearless companions to be, was not a dashing young man galloping through the desert on his horse. Rather, Umm Haram was an old woman, perhaps in her eighties or nineties. Nonetheless, that did not prevent her from accompanying the Muslim army in their first naval conquest of the eastern Mediterranean island of Cyprus. Umm Haram was the sister of Umm Sulaym bint Milhan, which also made her the maternal aunt of one of the Prophet's closest companions, Anas bin Malik. She was also a paternal relative of the Prophet via his great grandmother, who was from the Banu Najjar tribe. The Prophet Muhammad (peace be upon him) would often visit her. During one such visit, the Prophet was taking a nap in her home, upon which he woke up laughing. When Umm Haram asked the Prophet why he was laughing, the Prophet replied that he had seen a dream of his companions 'sailing on the sea like kings'. Umm Haram, despite her age, had a very youthful character and was an adventurous woman who liked to travel. The concept of sailing on the sea was unknown to most Arabs at the time, who were bound to the rough and tough deserts of Arabia. Umm Haram could not contain her glee on hearing this, and asked the Prophet to pray that she be among those companions. The Prophet made a supplication for her and went back to sleep, before he woke up again in the same manner. Again she asked the Prophet what he had seen, to which he gave the same answer, and then asked him to pray for her one more time. 'You will be with the first group,' the Prophet reassured. Long after the Prophet passed away, during the reign of the third Caliph Uthman, the governorship of Shaam (modern day Syria, Lebanon and Palestine) decided to form the first Muslim naval fleet under the command of Umm Haram's husband Ubadah bin al-Samit, who was the judge of Palestine. With the orders of Muawiyah, who was the governor of Syria at the time (later to become the first Umayyad Caliph), the fleet set sail in the year 647 to Cyprus, which was under Byzantine control at the time. The fleet arrived at the eastern shores of Larnaca, where they sought to continue their expedition on land. Shortly after mounting their horses, however, they came under siege and in the chaos that unfolded, Umm Haram fell from her horse and suffered a fatal injury. As was custom for martyrs, she was buried on the spot she fell, by the beautiful Salt Lake of the city. The Arabs continued their presence on the island of Cyprus for centuries afterwards. After the Ottomans conquered the island in 1570-1571 from the Venetians, they gave great importance to Umm Haram. In around 1760, a scholar by the name of Sheikh Hassan built a mosque close to her burial site, which became known as the Hala Sultan Tekke. 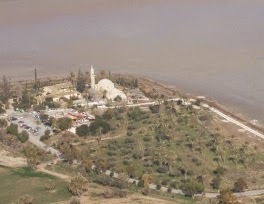 The mosque was, and still is, an important monument representing the 1,400-year history of Islam in Cyprus for all Muslims, especially the Turkish Cypriots. After the Cyprus war of 1974, which saw the island split with Turkish Cypriots forming the Turkish Republic of Northern Cyprus in the north and Greek Cypriots maintaining control of the south, the mosque remained with the Greek Cypriot administation. Turkish Cypriots were unable to access the mosque for thirty years until the borders were finally opened due to a breakthrough in negotiations. Today, Turkish Cypriots are campaigning for the Greek Cypriot administration to recognize the building's status as a place of worship. As it is currently registered as a museum, it is subject to museum opening and closing times, restricting Muslims from visiting and performing their prayers outside opening hours. Nonetheless, the glorious landscape around the mosque still draws visitors from all over the world, all coming to seek inspiration from the sacrifices Umm Haram made to leave Islam's mark on Cyprus and to pray for her soul. Her story inspired the likes of the wife of Sharif Hussein, the ousted post-Ottoman leader of the Hejaz and founder of the Hashimite royal dynasty in Jordan, who insisted on being buried in the same soil as Umm Haram. Upon entering the room in which Umm Haram's grave is located, one is almost suffocated by the sweet smell of musk. Despite this, the caretakers of the mosque insist that they have never perfumed the room, and that it is a natural aroma emanating from the grave itself. In 2013, out of their respect to Umm Haram, the Turkish Cypriots named a new theology faculty in Lefkosa (Nicosia) after her. He is `Abullah ibn `Uthman ibn `Amir ibn `Amr from a branch of the Quraysh tribe. His father, `Uthman, was known as Abu Quhafa. His mother, Salma, was also known as Umm Al-Khayr. From his early years, Abu Bakr (may Allah be pleased with him) was known for his good and upright nature. He was honest and truthful and came from a noble family. These things won him respect among the people. His goodness also won him the friendship of young Muhammad (peace and blessings be upon him). The two became fast friends in early boyhood. The friendship was to prove lifelong and history making. When he grew up, Abu Bakr (may Allah be pleased with him) became a rich merchant, but he remained very kindhearted. When he saw someone in trouble, his heart melted and he did his best to help him. If his money could remove suffering, he did not care how much he had to spend. Once he gave away 35 thousand dirhams out of his total fortune of 40 thousand. He was so honest in his dealings that people kept their money with him. But above all, Abu Bakr (may Allah be pleased with him) had a sincere heart and a firm will. Nothing could stop him from doing what he thought was the right thing to do. When the Makkans were intent on putting out, once and for all, the light of Islam, Allah commanded the Prophet (peace and blessings of Allah be upon him) to move to Madinah. In the burning heat of the midday sun, there was a knock at Abu Bakr's door. The Messenger of Allah (peace and blessings of Allah be upon him) sought permission to enter, and after everyone else had left the room, he told Abu Bakr, "I must leave for Madinah tonight." It was Abu Bakr (may Allah be pleased with him) who made all the arrangements for the historic journey. For three days he and the Prophet (peace and blessings be upon him) lay hidden in the cave of Thawr. Abu Bakr's slave tended flocks of goats near the cave all day and supplied them fresh milk for food. His son `Abdullah brought news about what the Makkans were doing. The Makkans were searching for the Prophet (peace and blessings of Allah be upon him) like mad hounds. Once they came right to the mouth of the cave. Abu Bakr (may Allah be pleased with him) grew pale, fearing not for himself, but for the Prophet (peace and blessings of Allah be upon him). However, the Prophet (peace and blessings of Allah be upon him) remained perfectly calm. "Do not fear," he said to Abu Bakr. "Certainly Allah is with us." Of all the companions, Abu Bakr (may Allah be pleased with him) had the honor of being with the Prophet during the most critical days of his life. Abu Bakr (may Allah be pleased with him) knew full well what this honor meant and did full justice to the trust put in him. After the Prophet’s death, Abu Bakr (may Allah be pleased with him) was chosen as the caliph. He served for only two years, three months, and ten days before he, too, passed away. During this short period, Abu Bakr (may Allah be pleased with him) was able to do great things for Islam that made his name immortal and placed him among the greatest men of all times. Sayyiduna Abu Bakr (may Allah be pleased with him) real name was Abdullah, and he was given the title of “As Siddique” or ”Testifier to the Truth.” His father, ‘Uthman, was known as Abu Quhafah and his mother, Salma, was known as Ummul Khair. 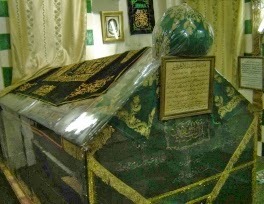 He was two and a half years younger than Sayyiduna Rasulullah (sallal laahu alaihi wasallam). The Holy Prophet (sallal laahu alaihi wasallam) told Abu Bakr (may Allah be pleased with him) what had happened at Mount Hira’, he told him that Allah subhanahu wa ta’ala has revealed to him and made him His Messenger. When Abu Bakr (may Allah be pleased with him) heard this from the Prophet sallallaahu ‘alayhi wa sallam, he did not stop to think, he at once became a Muslim. He submitted to Islam with such determination that once the Holy Prophet (sallal laahu alaihi wasallam) himself remarked: “I called people to Islam, everybody thought over it, at least for a while, but this was not the case with Abu Bakr (may Allah be pleased with him), the moment I put Islam before him, he accepted it without any hesitation”. He was titled As-Siddiq by the Prophet (sallal laahu alaihi wasallam) because his faith was too strong to be shaken by anything. In fact, Abu Bakr (may Allah be pleased with him) was more than a great believer, as soon as he became a Muslim, he immediately began to preach Islam to others. Among those who accepted Abu Bakr’s invitation to Islam were; Uthman, Zubair, Talha, Abdul Rahman bin Auf, Saadi bin Waqqas and others who later became the pillars of Islam. Abu Bakr’s love of the Prophet sallallaahu ‘alayhi wa sallam was so great that he was willing to sacrifice his life for the sake of protecting and comforting the Prophet (sallal laahu alaihi wasallam) saw. Such love and sacrifice were demonstrated when one day the Holy Prophet(sallal laahu alaihi wasallam) was saying his prayers in the Ka’ba, while some of the chiefs of Mecca were sitting in the court yard of the Ka’ba. Seeing the Prophet (sallal laahu alaihi wasallam) praying, ‘Uqbah bin Abi Mu’eet took a long piece of cloths and put it around the Prophet’s neck and twisted it hard in an attempt to strangle the Prophet sallallaahu ‘alayhi wa sallam to death. At that moment Abu Bakr (may Allah be pleased with him) happened to pass by from a distance, he saw ‘Uqbah trying to strangle the Prophet(sallal laahu alaihi wasallam) to death. Immediately Abu Bakr (may Allah be pleased with him) ran to the help of the Prophet(sallal laahu alaihi wasallam), he pushed ‘Uqbah aside and took the cloth from around the Prophet’s neck. Thereupon the enemies of Islâm came down upon Abu Bakr and beat him unnerafully, although Abu Bakr (may Allah be pleased with him) with faith like a rock did not care for his own suffering, he was glad that he was able to save the Prophet of Allah (sallal laahu alaihi wasallam), even at the risk of his own life. Abu Bakr (may Allah be pleased with him) with the wealth he had, also had a major role in freeing some of the Muslim slaves, who were barbarically tortured by their heartless Mushrik masters to give up the Faith and return to their masters’ beliefs. The heartless monsters tried all kinds of torture: they made them lie all naked on the burning desert sand, putting big stones on their chest, as well as other kinds of torture. Here Abu Bakr’s wealth came to the rescue, as he bought the poor helpless slaves from their inhuman masters and set them free, Bilal Al-Habashi, the slave of Umayya bin Khalaf, was among those who were set free by Abu Bakr (may Allah be pleased with him). Bilal became afterwards the Mu’azzin at the Prophet’s mosque. The Prophet (sallal laahu alaihi wasallam) informed Abu Bakr (may Allah be pleased with him) that he was commanded to migrate to Madinah that night and that he has chosen him to have the honor of joining him on his migration. Abu Bakr’s heart was full of joy : “I have been looking forward to this day for months” he exclaimed. The Meccans were so eager to find the Prophet (sallal laahu alaihi wasallam) they were searching for him like mad hounds. Once they came to the mouth of the cave, Abu Bakr (may Allah be pleased with him) grew pale with fright, he feared not for himself, but for the life of the Holy Prophet (sallal laahu alaihi wasallam) . However, the Prophet sallallaahu ‘alayhi wa sallam remained calm and said to Abu Bakr “do not fear, certainly Allah is with us”. Such words quickly calmed down Abu Bakr and brought back tranquility to his heart. Abu Bakr (may Allah be pleased with him) loved his faith more than anything else. At the Battle of Badr, his son, Abdur Rahman, was fighting on the side of the Kuffar. After accepting Islam, Abdur Rahman said to his father, “O Father, at Badr, you were twice under my sword, but my love for you held my hand back.” To this, Abu Bakr replied, “Son, if I had you only once under my sword, you would have been no more.” He was so uncompromising in his faith. Abu Bakr’s great love of the Prophet (sallallaahu ‘alayhi wa sallam) was demonstrated when peace talks at Hudaibiya were held. During the negotiations, the spokesman of Quraish was touching the beard of the Prophet (sallallaahu ‘alayhi wa sallam) every now and then. Abu Bakr’s love for the Prophet (sallallaahu ‘alayhi wa sallam) was so great that he could bear no more, he took out his sword and looked angrily at the man saying, “…if that hand touches the beard of the Prophet (sallallaahu ‘alayhi wa sallam) again, it will not be allowed to go back”. Tabuk was the last expedition of the Holy Prophet(sallallaahu ‘alayhi wa sallam). He was keen to make it a great success, he therefore asked people to help the expedition with whatever they could. This brought the best out of Abu Bakr who beat all records as he took all his money and household articles and heaped them at the Prophet’s feet. “Have you left anything for your children?” asked the Prophet (sallallaahu ‘alayhi wa sallam). Abu Bakr (may Allah be pleased with him) then responded with great faith “Allah and his Messenger are enough for them”. Companions standing around were stunned they realized that whatever they do they could not out do Abu Bakr (may Allah be pleased with him) in the field of service to Islam. Thus in the lifetime of the Prophet (sallallaahu ‘alayhi wa sallam), Abu Bakr came to fill the highest position under Islam (leading prayers). While one day Abu Bakr (may Allah be pleased with him) was away Umar was appointed by the Companions to lead the prayers in his absence. Realizing the change of voice, the Prophet (sallallaahu ‘alayhi wa sallam) said: “This is not Abu Bakr’s voice, no one but he should lead prayers, he is the fittest person for this position”. When the news of the Prophet’s death came out, many Muslims were confused and stunned. Umar himself was so overcome with emotions that he drew his sword and declared: “If anyone says that the Messenger of Allah is dead, I will cut off his head”. Muslims stayed in such state until Abu Bakr arrived and gave his famous address: “O People! If anyone among you worshiped Muhammad, let him know that Muhammad is dead. But those who worshiped Allah, let them know that He lives and will never die. Let all of us recall the words of the Qur’an. It says: “Muhammad is only a Messenger of Allah, there have been Messengers before him. What then, will you turn back from Islam if he dies or is killed?” Suddenly Abu Bakr’s words started to sink in, and in no time confusion was gone. Having shrugged off the shocking news of the Prophet’s death, Muslims realized that they need someone to fill the position of leadership amongst them. The two main groups amongst Muslims were Muhajirun (refugees from Mecca), and Ansar (the people of Madinah). The Ansar gathered at the Thaqifa Bani Saida their meeting place. Saad bin Abada the Ansar leader suggested that the Caliph should be from amongst them. Although many refused saying that the Muhajirun in right have a better claim to Khilafah. When the news reached Abu Bakr (may Allah be pleased with him), he quickly went to their gathering, fearing that confusion might spread once again, and said : “Both Muhajirun and Ansar have done great service to Islam. But the former were the first to accept Islam, they were always very close to the Messenger of Allah (sallallaahu ‘alayhi wa sallam) . So, O Ansar, let the Caliph be from amongst them”. After a short discussion, the Ansar agreed that they should choose the Caliph from amongst the Muhajirun, being from the tribe of Quraish and being the first to accept Islam. Abu Bakr (may Allah be pleased with him) then asked people to choose between Umar bin Al-Khattab and Abu Ubaida Ibn A-Jarrah. Hearing this, both men jumped to their feet and exclaimed: “O Siddiq, how can that be? How can anyone else fill this position as long as you are among us? You are the top man amongst he Muhajirun. You were the Companion of the Prophet sallallaahu ‘alayhi wa sallam in the Thawr cave. You led prayers in his place, during his last illness. Prayer is the foremost thing in Islam. With all these qualifications you are the fittest person to be the successor of the Holy Prophet (sallallaahu ‘alayhi wa sallam) . Hold out your hand that we may pledge loyalty to you”. But Abu Bakr (may Allah be pleased with him) did not stretch out his hand. Umar saw that the delay might lead to the reopening of the disagreements so he himself took Abu Bakr’s hand out and pledged loyalty to him. Others followed by example, and Abu Bakr became the first Caliph by general consent of the Muslims. “O People! I have been chosen by you as your leader, although I am no better than any of you. If I do any wrong, set me right. Listen, truth is honesty and untruth is dishonesty. The weak among you are the powerful in my eyes, as long as I do not give them their dues. The powerful among you are weak in my eyes, as long as I do not take away from them what is due to others". “Listen carefully, if people give up striving for the Cause of Almighty Allah, He will send down disgrace upon them. If people become evil-doers, Almighty Allah will send down calamities upon them". Ali radiallaahu ‘anhu along with some of his relatives delayed their pledge of loyalty to Abu Bakr for six months after a difference of opinion with the Caliph due to the right of inheritance of the Prophet’s land. Although both men respected each other, and Ali soon after the death of his wife Fatimah gave the pledge of loyalty to Abu Bakr. Such was the quality of the humble and generous Companion who believed the Prophet in everything to the extent that he was called As-Siddiq, by the Prophet (sallallaahu ‘alayhi wa sallam). His great personality and service to Islam and Muslims earned him the love and respect of all Muslims, so that he was chosen as the first Caliph after the death of the Prophet (sallallaahu ‘alayhi wa sallam) by all Muslims. 1. To eat less is healthy, to speak less is wisdom, and to sleep less is worship. 2. The one who steps back will not progress. 4. After Iman (Faith), there is no greater gift than a pious wife. 5. Attain knowledge before old age settles in. 6. Whosoever hides his secret keeps his safety, safeguarded with himself. 7. The person who calls himself learned, indeed he is ignorant, and the one who calls himself from the dwellers of Paradise surely he is from the dwellers of Hell. 8.The Strength in action is, never to put of what you can do today for tomorrow. *That women with whom her husband is happy and accepting. 10. Once a sheep was slaughtered and Syeduna 'Umar al-Farooq Radi ALLAHu Ta'ala Anho persistently asked his servant if he had first sent meat to his neighbour who was a Jew. The slave asked why you are asking the same question persistently. He answered that ALLAH SubHanuhu wa Ta'ala and his Rasūl Sallallaho Alaihi wa Sallam had constantly stressed the importance of neighbors therefore I too am persistent in stressing the same. 12. Faith (Iman) is to regard the Oneness of ALLAH SubHanuhu wa Ta'ala in ones heart proclaim it with your tongue and to obey the fundamental Islamic Instructions. 13. The relationship of true humility and genuine fear of ALLAH SubHanuhu wa Ta'ala is with the heart and not by a show of outward actions. 14. I do not look at anything, except, that I see everything with ALLAH SubHanuhu wa Ta'ala. 15. Do not have Faith in a person's compassion and politeness when he cannot keep his anger under control. 16. Good deeds are the fulfillment of one's rights and to do good deeds is a substitute for bad deeds. 17. Youth before old age and old age before death is a blessing of life. 18. Death is the best teacher. 20. To laugh excessively is a sign of no remorse for death. 21. To educate a seeker of materialism is to place a sword in the hands of a highway robber. 22. Prayer is connected to the heart not by mere apparent actions. 23. One should not judge a person by the number of Salaat (prayer) or Roza (fasting) but by his wisdom and honesty. 24. Do not taunt and curse anyone for this gives rise to collective evils in a person. 25. Be sympathetic towards the poor so that they may be able to speak and build courage. 26. The most intelligent amongst you is he who fears ALLAH SubHanuhu wa Ta'ala the most. 27. Remove your gaze from the splendor of the World. Do not let the love of this World enter your heart. Beware! The love of this World does not perhaps destroy you, just as it had destroyed previous nations. 28. To stop sinning is easier than to bear the burden of seeking repentance. 29. Do not forget about yourself whilst being concerned for others. 30. There is never a chance of pain in the neck if one does not raise his head too high in the air. Jerusalem to conquer Bait al-Maqdas, the Christian Crusaders were terrified of his presence and requested a meeting with him before handing over the keys of the city. The Crusaders met him whilst he wore a patched garb. They asked him the reason as to why his name generated such immence awe and fear that captured the hearts of his enemies. He replied; "Your kings taught you to love the World (Duniyah) and its wealth and our Prophet Sallallaho Alaihi wa Sallam taught us to fear ALLAH SubHanuhu wa Ta'ala and love death. fear ALLAH SubHanuhu wa Ta'ala and love death. 32. Whosoever shows you your faults, he is your friend. Those that pay you lip service in praise are your executioners. 33.The person who constantly discloses my faults to me is dearest to me. 34. Honour and dignity in this World is measured by wealth while honour and dignity in the Hereafter is measured by good deeds. 35. Save yourself from the Fires of Hell even if it means by doing a favour with half a date (fruit). If this too is not possible then with sweet words. 35. We should leave the other nine portions out for the fear of Haram (unlawful). (i.e. if in ten portions one is Haram a Muslim would leave the other nine portions out meaning anything unlawful would be completely left out). 36. We should leave the other nine portions out for the fear of Haram (unlawful). (i.e. if in ten portions one is Haram a Muslim would leave the other nine portions out meaning anything unlawful would be completely left out). 37. When you combine lawful with unlawful gains then the unlawful contaminates the lawful gains though it may be little. Ali “Ibn” (son of) Abu Talib was the young cousin of Holy Prophet Muhammad ﷺ. This child, who greatly admired his older cousin, grew into a noble warrior for Islam, a knowledgeable judge, a remarkable exegete of Quran and a righteous leader of the Muslim nation. Ali (may Allah be pleased with him) was born in Mecca around the year 600 CE. His father was Abu Talib, Prophet Muhammad’s uncle and staunch supporter. When Ali (may Allah be pleased with him) was a young child, a great famine ravaged the area around Mecca, food was scarce, and many families were unable to feed and clothe their children. Muhammad ﷺ, who was not yet a prophet, offered to nurture and care for his young cousin. Consequently, Ali (may Allah be pleased with him) was raised by Muhammad ﷺand his first wife Khadijah. Ali (may Allah be pleased with him) adored his older cousin and followed him around copying Muhammad’s actions. As he (may Allah be pleased with him) grew older, Ali (may Allah be pleased with him) also began to emulate Muhammad’s noble ways. When Ali (may Allah be pleased with him) was around 10 years of age, Muhammad ﷺreceived the first revelations of the Holy Quran from God Almighty. Ali (may Allah be pleased with him) was there with his cousin when Muhammad ﷺ, may the mercy and blessings of God be upon him, revealed to his family that he had been called to be the Messenger of God. It is said that Ali (may Allah be pleased with him) witnessed Muhammad ﷺand Khadijah (may Allah be pleased with him) praying to God and that he asked about what he had seen. As soon as Prophet Muhammad ﷺexplained the message of Islam to his young cousin, Ali (may Allah be pleased with him) accepted it as the truth. However, before he embraced Islam he thought deeply about what his father’s reaction would be. The next morning Ali (may Allah be pleased with him) testified that there was no god worthy of worship but Allah and that Muhammad was His messenger. Ali (may Allah be pleased with him) has the honour of being the first child to accept Islam. Some scholars of Islam believe that Ali (may Allah be pleased with him) may have been older then 10 years when he accepted Islam, therefore you may read in various texts that Ali (may Allah be pleased with him) was the first youth to embrace Islam. Nevertheless, Ali’s age is not of primary importance, what counts the most is that he was a bright and clever young man, eager to learn and eager to worship God in the correct manner. Many scholars point out that Ali (may Allah be pleased with him) was one of many young men and women around the Prophet Muhammad ﷺwho had never been initiated into the idolatrous rituals of the pre Islamic Arabs. Ali never prostrated before anything or anyone but God. Ali (may Allah be pleased with him) spent his childhood with Fatima, the youngest daughter of Muhammad ﷺand Khadijah (may Allah be pleased with her). Some years later when the Muslim community had migrated from Mecca to the city of Medina Ali went to Prophet Muhammad ﷺand proposed marriage to Fatima (may Allah be pleased with her). Ali (may Allah be pleased with him) however was upset by the fact that he was very poor and had nothing of value to present to Fatima as a bridal gift. Prophet Muhammad ﷺreminded him that he had a shield, to sell. Ali (may Allah be pleased with him) sold the shield to Uthman ibn Affan and was about to run excitedly back to the Prophet ﷺwhen Uthman (may Allah be pleased with him) stopped him and returned his shield, offering it as a marriage gift to Ali and Fatima (may Allah be pleased with them). It is believed that Fatima and Ali were in their middle to late teens when Prophet Muhammad ﷺhimself performed their marriage ceremony. The young boy who had followed his older cousin around like a shadow had grown into a noble young warrior. When God revealed the verse, “and warn your tribe. O Muhammad.” (Quran 26:214) Prophet Muhammad ﷺinvited all his relatives for a meal; after they had eaten he addressed them and asked who from his family would join him in God’s cause? None had the courage to answer but a boy in his early teens. Ali (may Allah be pleased with him) was that boy and he (may Allah be pleased with him) stood tall in the face of laughter and derision and expressed his desire to help Prophet Muhammad ﷺin whatever way he (may Allah be pleased with him) could be of service. In the difficult times that lay ahead, Ali (may Allah be pleased with him) stood firm, and repeatedly demonstrated his courage and love for God and His Messenger ﷺ. When the disbelievers of Mecca planned to kill Prophet Muhammad ﷺ, it became necessary for him and Abu Bakr (may Allah be pleased with him) to leave Mecca under the cover of darkness. As they walked into the desert night it was the teenager Ali (may Allah be pleased with him) who slept in Muhammad’s bed, knowing that at any minute there could be assassins attempting to murder him. Ali (may Allah be pleased with him) survived the night, and in the coming days, he returned the valuables that had been left in trust with Prophet Muhammad ﷺ, to their rightful owners. Prophet Muhammad ﷺconsidered his young cousin to be amongst the bravest, trustworthy and pious of his companions. Soon afterwards, Ali (may Allah be pleased with him) joined his beloved cousin in Medina. Prophet Muhammad ﷺso cherished his young cousin he called him by many fond and endearing names. The name that Ali (may Allah be pleased with him) treasured most was Abu Turab (Father of Dust). Once when Ali (may Allah be pleased with him) was sleeping in the mosque courtyard, his back became covered with dust. Prophet Muhammad approached him, pulled him to his feet, and wiped the dust of his back, laughingly calling him Abu Turab. Prophet Muhammad ﷺalso called Ali Haidarah (the lion). Prophet Muhammad’s young shadow grew into a respected warrior for Islam. Ali (may Allah be pleased with him) was the fourth rightly guided Caliph. He (may Allah be pleased with him) followed in the footsteps of Prophet Muhammad ﷺ, Abu Bakr, Umar, and Uthman (may Allah be pleased with them), and ruled the Muslim Empire, according to the divinely revealed law of God, from approximately 656 to 661 CE. Ali (may Allah be pleased with him) was the young cousin and son in law of Prophet Muhammad. He (may Allah be pleased with him) spent his childhood emulating the noble character of his beloved cousin, and his youth learning the details of Islam. Ali (may Allah be pleased with him) grew into a noble warrior; physically strong and assertive but with a humble heart, filled with love for God and His messenger Muhammad ﷺ. Muslims remember Ali (may Allah be pleased with him) for his courage, his honesty, his generous and kind behaviour towards others, and his unswerving devotion to Islam. After the migration to Medina, Ali (may Allah be pleased with him) married his childhood companion Fatima (may Allah be pleased with her), daughter of Prophet Muhammadﷺ. The young couple led a simple and austere life, for Ali (may Allah be pleased with him) did not care for material wealth, rather he was focused on pleasing God and attaining everlasting life in the hereafter. They had no servants or slaves. Ali (may Allah be pleased with him) drew and carried water and Fatima would grind the corn until her hands were rough and sore. Once when the young couple approached Prophet Muhammad ﷺasking for a servant he rebuked them by saying that he could not give them such luxuries when hungry poor people filled the mosque. Ali and Fatima (may Allah be pleased with them) returned home feeling quite dejected. That evening Prophet Muhammadﷺvisited Ali and Fatima (may Allah be pleased with them) in their home. Heﷺsat on the edge of their bed and taught them words of remembrance with which to praise God. He ﷺassured them that remembering God would be more beneficial for them than a servant or slave to ease their workload. Ali (may Allah be pleased with him) never forgot the words of advice given to him that night, later in his life he said that not a night passed that he did not recite those words before sleeping. Ali (may Allah be pleased with him) and his family went to great lengths to please God, often they would go hungry themselves giving away all their food to people poorer than themselves. Ali’s generosity new no bounds, he treated everyone, friend or foe, with respect and kindness. Imam (Scholar) Ahmad described Ali as one of the most virtuous of Prophet Muhammad’s companions and Ali was known to be amongst the Prophet’s most staunch supporters. Ali (may Allah be pleased with him) deservedly became known as a strong warrior and he distinguished himself in the crucial first battle against the unbelieving men of Mecca, known as the Battle of Badr. The young lion of God participated in all the battles fought in the early days of Islam except on one occasion. It is reported in the authentic traditions of Prophet Muhammad ﷺthat during the battle of Khaybar Prophet Muhammad ﷺbestowed a great honour on his young cousin. Prophet Muhammadﷺinformed his companions “Tomorrow I shall give the standard (flag) to a man who loves God and His Messenger and is also loved by God and His Messenger, he does not flee the battlefield, and God will bring about victory through him”. The companions of Prophet Muhammad ﷺspent the night wondering who the flag would be handed too. Omar Ibn Al Khattab (may Allah be pleased with him) is believed to have said that it was the only time he longed for leadership, but this particular honour belonged to Ali(may Allah be pleased with him). After Uthman Ibn Affan (may Allah be pleased with him) was murdered in the service of the Muslim nation, Ali (may Allah be pleased with him) was chosen as the fourth of those known as the rightly guided Caliphs. Many Muslims were eager for Ali (may Allah be pleased with him) to take on leadership but Ali (may Allah be pleased with him) was concerned that already the seeds of rebelliousness were being sewn among the believers. He (may Allah be pleased with him) hesitated until some of the companions who had been closest to Prophet Muhammad ﷺurged him on and gave him their support. The events surrounding Uthman’s murder had flung the young Muslim nation into a period that became known as the “time of tribulation”. Ali (may Allah be pleased with him) began and ended his Caliphate in times of trial and tribulation however; he (may Allah be pleased with him) remained true to his convictions and ruled in a manner that befitted the child who learned his morals and values at the feet of the Prophet Muhammadﷺ. Ali (may Allah be pleased with him) was a profoundly religious man; he (may Allah be pleased with him) was devoted to Islam and strove in his daily life and his position as leader to uphold the Quran and the authentic traditions of Prophet Muhammadﷺ. War broke out amongst the Muslims and Ali (may Allah be pleased with him) found himself attempting to lead a nation beset with rebellion and in fighting. Throughout this time of civil strife and war, Ali (may Allah be pleased with him) was ever mindful of the great task that lay before him. He (may Allah be pleased with him) was responsible for the people of the Muslim nation. At this point is must be clearly noted that Ali and Uthman (may Allah be pleased with them) were brothers in Islam, both devoted too God, His messenger Muhammad and the religion of Islam. Both ruled the Muslim nation with humble hearts, austerity, and piety. However, their world was changing in dramatic ways and some of their actions were difficult to understand then and now. However, in retrospect it is clear that their love for Islam and desire for the hereafter for all the believers was never in question Ali (may Allah be pleased with him) remained noble, courageous, and generous. Even in perilous times, he (may Allah be pleased with him) forgave his enemies and wanted only unity for the Muslim nation. Ali (may Allah be pleased with him) was murdered with a poisoned arrow. The assassin, who struck while Ali was praying in the mosque, brought to an end the life of the lion of God and the era of the four rightly Guided Caliphs. Abu Bakr, Umar Ibn al Khattab, Uthman Ibn Affan, and Ali Ibn Abu Talib (may Allah be pleased with them) were men of noble statue and high moral fibre, they ruled with the Quran and the lessons taught to them by Prophet Muhammadﷺ. Sadly, the world is unlikely to see men such as these again before the end of days.